This All in One golf package has just one extra touch for golfers that would like to get more familiar with the Vietnamese culture and really explore Vietnam at its best. Starting in the capital of Hanoi where you just have enough time to get to know the city and play the best courses you will make an overland transfer to famous Halong Bay, a superb picturesque spot, and will stay overnight on boat to cruise the bay. After this amazing cruise you will fly to the beachside destination of Danang. Golfers will play the best courses and learn more about the traditional handicraft and architecture. If you did not get enough from the beach yet don’t worry because afterwards you will visit one of the most gorgeous bays in the world Nha Trang. 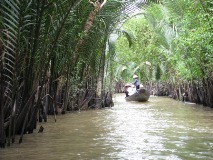 To really end your trip with Vietnam at its best a visit to Saigon cannot be forgotten.